Written and directed by J.D. Lewis. 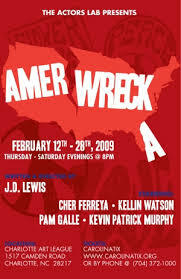 AmerWrecka had its international premiere at the renowned Fringe Festival in Edinburgh, Scotland, in August 2005. With five-star reviews and the buzz from the Festival, it became one of the most sought after plays for 2006. Fifteen members of The Actor’s Lab traveled to Limerick, Ireland, where AmerWrecka headlined The Unfringed Limerick Festival. With sold-out houses and standing ovations, it continues its momentum by going into pre-production for the feature film version and also a theatrical run in New York City.